ERA is excited to announce our new book all about Toronto’s St. John’s Ward. 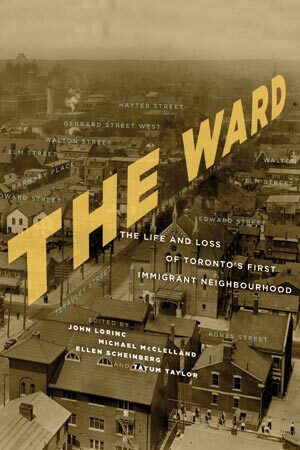 The Ward: The Life and Loss of Toronto’s First Immigrant Neighbourhood, launches May 20th. A number of events lead up to this exhilarating new release. The Ward will be presented in the Pages UnBound Festival, an annual mixed media festival combining the finest contemporary Canadian writers with practitioners from digital media and other art forms. Tickets for the festival are available online through Eventbrite. May 7, 6:30pm – The festival begins with an Opening Pub Night celebrating contemporary cultural production. Location: CSI Annex 720 Bathurst St., Toronto. May 10, 7:00pm – 9:00pm – Hosted by Gerry Flahive, the closing panel of the Pages UnBound Festival features John Lorinc, Vincenzo Pietropaolo, Ellen Scheinberg, and ERA’s Michael McClelland. Location: The Randolph Theatre 736 Bathurst Street, Toronto. May 20, 7:00pm – 10:00pm – Official book launch. Details forthcoming. Location: Church of the Holy Trinity, 10 Trinity Sq., Toronto. May 28, 1:00pm – 2:30pm – The editors of The Ward and several contributors will host a panel on a selected topic at City Hall. Details to come, but in the meantime mark your calendars! Location: City Hall Library, Toronto City Hall, 100 Queen St. W., Toronto.